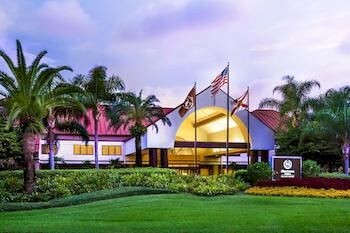 LocationThe hotel lies approximately 1.6 km from Orlando International Airport and is only a short drive away from Walt Disney World, Universal Studios, Sea World, and Wet n' Wild. The hotel offers a complimentary shuttle to and from the airport.FacilitiesThe establishment comprises a total of 150 accommodation units. Guests of the establishment are welcomed in the lobby area, where a 24-hour check-out service is available. A lift can be used to access the upper floors. Services and facilities at the hotel include a safe, internet access, wireless internet access, a restaurant, a transfer service, a conference room and coin-operated laundry. Guests travelling in their own vehicles can make use of the available parking spaces. A shuttle service is offered.RoomsAll accommodation units feature air conditioning, central heating and a bathroom. Bathrooms with wheelchair access can also be booked. In most accommodation units, guests can enjoy a balcony with pleasant views. The carpeted accommodation units feature a double bed or a king-size bed. A desk is also available. For self-catering guests, there is a well equipped kitchenette with a fridge, a mini-fridge, a microwave and tea and coffee making equipment. An ironing set is also available to guests. Each accommodation unit offers internet access, a telephone, a TV, a radio and an alarm clock. Wheelchair-accessible rooms are also bookable. Each of the bathrooms features a shower and a hairdryer.Sports/EntertainmentA refreshing dip in the indoor or outdoor pool can be pleasantly cooling on hot days. A hot tub provides an opportunity for relaxation. The establishment's leisure facilities include a gym. PaymentAll major credit cards, including American Express, VISA and MasterCard, are accepted for payment.